Good morning!! Spring is now in full swing here in Iowa and it is a glorious! I love spring and summer, so I feel like I have woken up from a long sleep. It feels good to feel good! Last week I finished quilting my Farmer's Wife quilt. I didn't do a very good job with the picture, so use your imagination. I chose to stitch in the ditch with most of them. I used wool batting so it has a bit of loft. 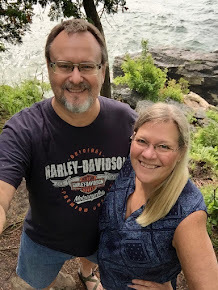 As I was working on it, I doubted myself the whole time that I was making a mistake and was tempted to rip it all out and start over, but hubby encouraged me to keep going and he thought it looked just fine. It is what it is. No going back now! And the back view...The author of the Farmer's Wife, Laurie Hird, has a new Farmer's Wife 30's book coming out. I have a stash full of 30's, so I may tackle that one in the years to come. On the sewing front. I am making Thimble Blossoms new quilt pattern Swoon Sixteen for a friend of mine. As the name suggests, the blocks finish at 16" instead of the 24" that the original Swoon pattern made. For her quilt, she chose Horizon by Kate Spain and a teal Grunge background. Again, the picture isn't very good. In real life, the colors really pop on the teal background. I am making the pattern bigger, so I need to make 20 blocks. Each one takes about an hour to make, so it is slow going. I have 12 more to go. New fabric has joined my stash, Ambleside by Brenda Riddle. The colors are so happy and fun...I have no plans for them yet. And see the thread? I purchased silk thread last weekend to give it a try. Silk thread is very fine, but strong! I can't wait to give it a try! I love your FWQ! I think stitching in the ditch is a great idea. It emphasizes the piecing. I did that with most of the blocks on my FWQ also. Yeah for Spring in Iowa!! It is heavenly. So nice to go out and work in the flower beds and rake up leftover leaves; the grass is getting so green. Love your FW quilt; looks wonderful to me. I'm working on a FW myself and have around 23 blocks done; my intentions are to do all of them! 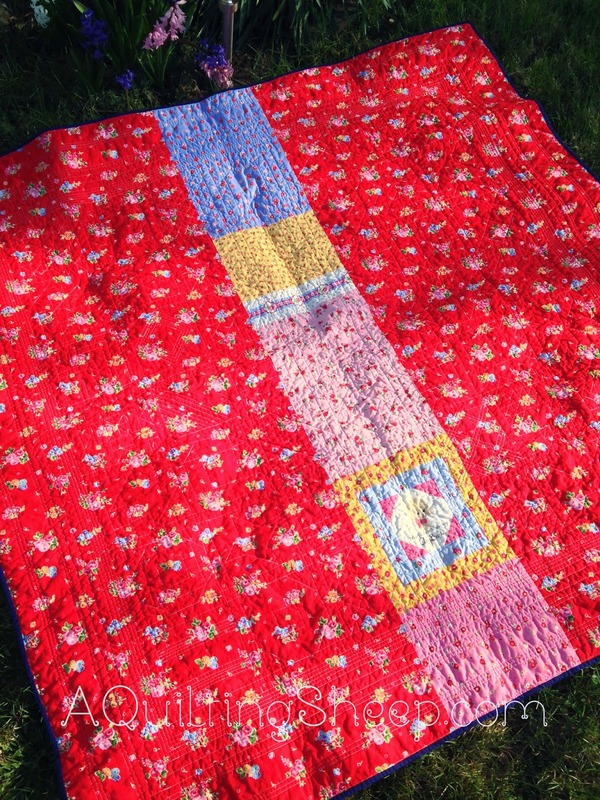 Love the colors in your Farmer's Wife Quilt - it is just beautiful and looks extremely cozy. Great job on your Swoon Quilt too - love the background solid you used with it. Our spring is showing its face around here too - I especially love the sound of all the birds again - I've really missed them! yours just might be my favorite farmers wife finish that i have seen....it looks amazing. i love the colors and fabrics you used. 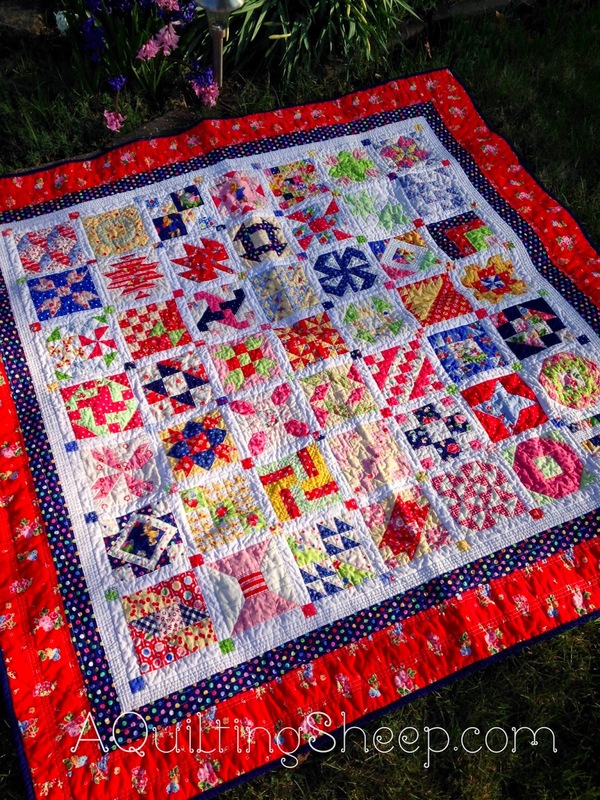 Oh my goodness Amy such gorgeous eye candy here - I LOVE your FW, I think you quilted it beautifully! And I love the Swoon. That background really makes the colors pop! Love the new fabric and thread....so so pretty! Your farmer's wife is gorgeous! I have doubts too, but DH tells me if I am being OCD or it if is really terrible. Love your Swoon 16. I finally decided to make my Swoon and have very slowly been cutting and sewing. 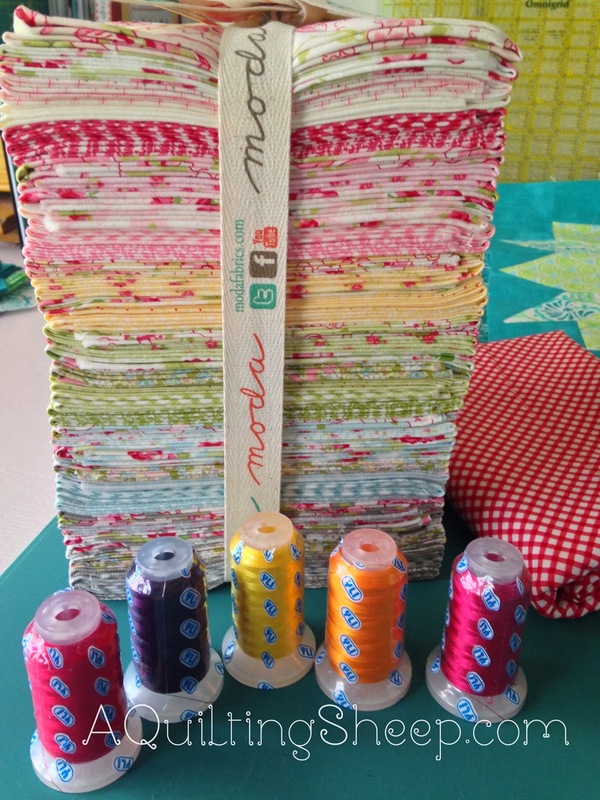 Love the colors you are using and isn't the Ambleside fabric just gorgeous. Very pretty Farmers Wife quilt. This quilt is on my bucket list to make. Thanks for sharing. Your quilt looks great< I will have to try quilting one of my quilts myself soon. I love the Ambleside fabric. I saw it for the first time the other day. I think some of this fabric will have to come home with me soon. Love the background on your swoon quilt too. Happy Spring. Amy, everything is just beautiful. You quilt is bourbon I have the book and cd but have never done even one block. I have the original Swoon pattern but never finished it. 😟 I love that fabric I am going to have to check that out! Thanks for sharing this with us. Your quilt turned out beautifully! 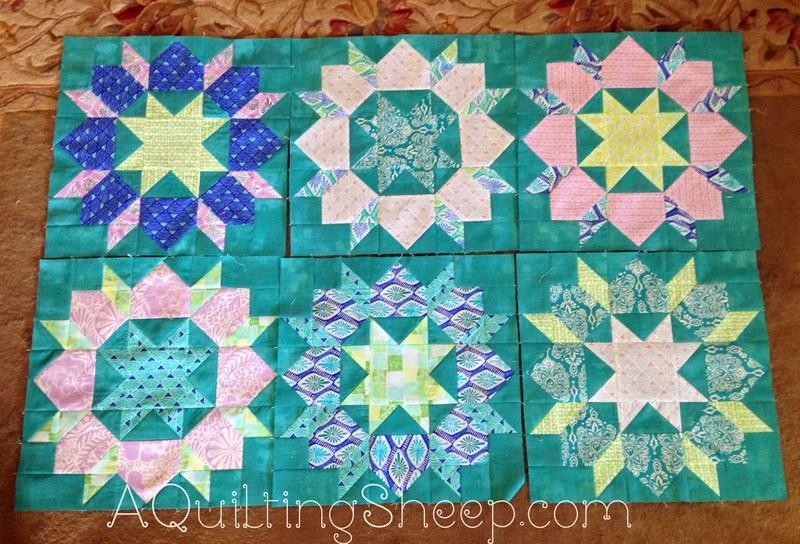 And I love the swoon blocks with the teal background. Good choice! What are you going to use the silk thread for? 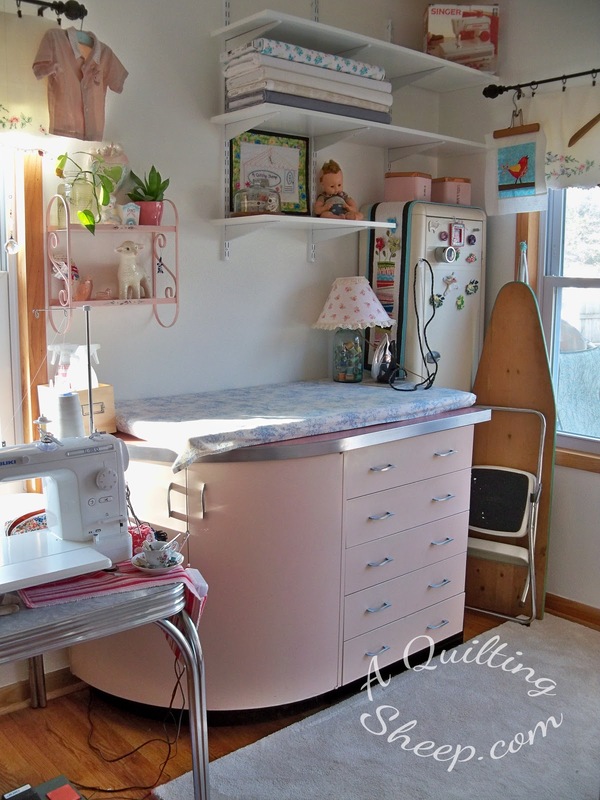 Quilting?? 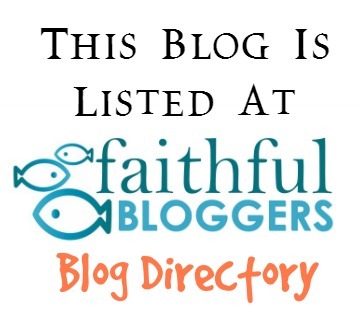 I just found your blog and it is so cheerful. You are a busy quilter. Spring has sprung here. Finally! Your quilts turned out great! Quilts are wonderful! !You are awesome! Thank you for the Farmer's Wife 1930 new book scoop!! I will pass it on! I preordered mine....wooohooo I should have my present FW blocks done and Andrews Grad quilt done, delivered and sealed! by the coming of the new book for the summer treats!! Hugs!!! love your swoon blocks. that one is on my list for future started projects. for now finishing UFOs is the project of the day. Amy I love seeing your Farmer's Wife. I think it turned out awesome. Still have not even started mine. Thank you so much for sharing about her new book. Sent a link right away to hubby. Usually he gets the hint. lol I have tuns of 30's too. I am loving the quilt you are making for your friend. You are such a sweet heart. Hope you are doing well my dear? I didn't know a new book was coming out! How wonderful! Your quilt looks fabulous. And that stack of fabric - GORGEOUS! I might need some in my life.